In this article, as promised, I'm going to talk about the potential that 1687 was a long-term top. Over the past few months, I've occasionally alluded to the fact that I was tracking the current rally as a potential extended fifth wave. In layman's terms, extended fifth waves are generally called "blow-off tops." I've felt a number of markets have shown the characteristics of such a wave. On and off for several months, I've toyed around with extended fifth wave counts for the S&P 500 (SPX), though I haven't published any of them, since I didn't feel they were near completion previously -- and thus a moot point. 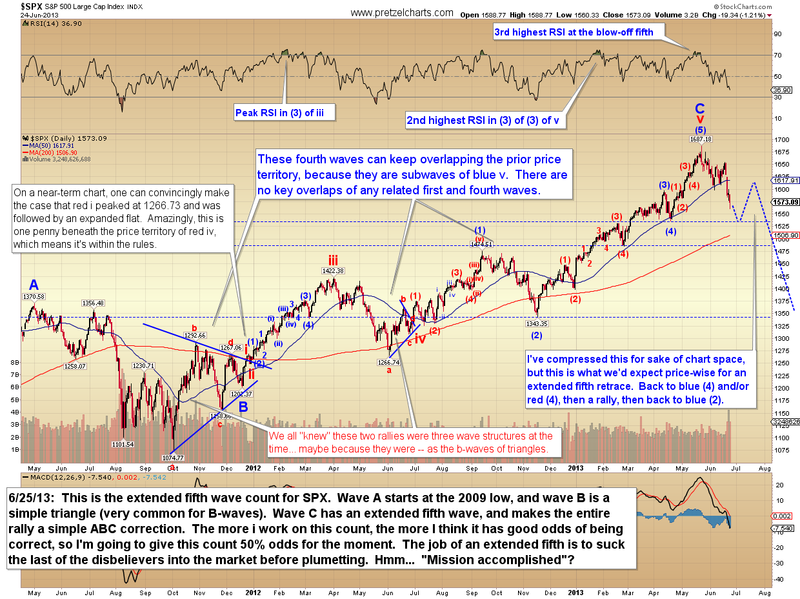 In this update, we're going to look at the long-term wave count for SPX which details an extended fifth. One thing I've always enjoyed about Elliott Wave Theory is the psychological component which underpins each wave. Extended fifth waves serve a purpose in mass sentiment, and they function to pull the last of the disbelievers into a move -- just before reversing. When extended fifths reverse, they often do so quite dramatically, and this serves to trap unwary traders on the wrong side of the trade, which gives the subsequent decline steam. Extended fifths can be extremely difficult to spot in real-time, because they don't die off slowly, the way a normal rally does. They die at near-peak readings, which lulls bulls into a complacent sense that there's still more upside left, due to the momentum of the move. The current rally fits these characteristics, though it also fits the characteristics of a third wave, which would in fact have more upside left -- and this is what makes it so difficult to sort out the two options. Let's discuss some of the merits of this count. 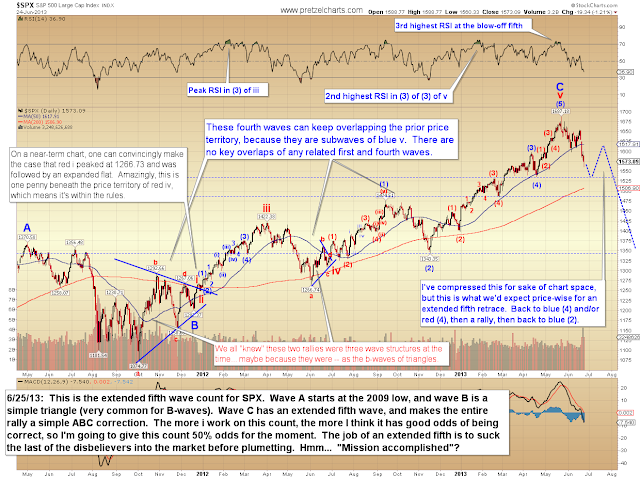 The chart below shows that SPX actually counts quite well as a fifth wave extension. I haven't seen this wave count anywhere else (though that really isn't saying much, since I generally entirely avoid looking at other people's technical work. I find I do my best work "in a vacuum" so to speak, and other people's work tends to bias me). 1. 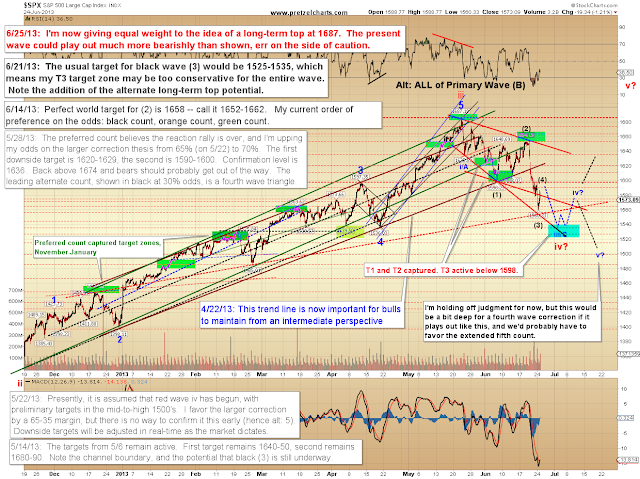 The October rally in 2011 was almost certainly a three-wave rally. Every Elliottician on the planet knew it at the time, and we all expected it was a corrective wave. After the October peak was exceeded, we all scratched our heads and tried to figure out where we went wrong. The count shown above explains this quite well: We didn't go wrong in counting that wave; it was indeed three waves. We went wrong in not realizing it was part of a triangle. (I actually hypothesized this via NYA back in late 2011, but the expectations of that count got a bit fuzzy as the rally continued, and I eventually put it on the back burner). 2. The same is true of the rally in the middle of 2012. Also note how well this count explains the rest of the move throughout that same time frame. This is the only count I've ever seen that fits that entire wave this well. 3. This count eliminates the need for endlessly nested first and second waves at the beginning of the move, because all the waves are sub-waves of the extended fifth, and thus there is no technical issue created from the price overlap at the beginning of the structure. 4. This makes the rally from 2009 a simple, common ABC rally, without reaching into extremely rare triple zigzags and such. Personally, I don't feel the triple zigzag counts fit very well anyway, since, in my opinion, the waves are too disproportionate to each other. 5. The RSI readings are perfect for the count. In fact, RSI fits this count better than it fits any other count I've developed or seen. Peak RSI during the third wave, second highest during (3) of v, third highest during the blow-off fifth. 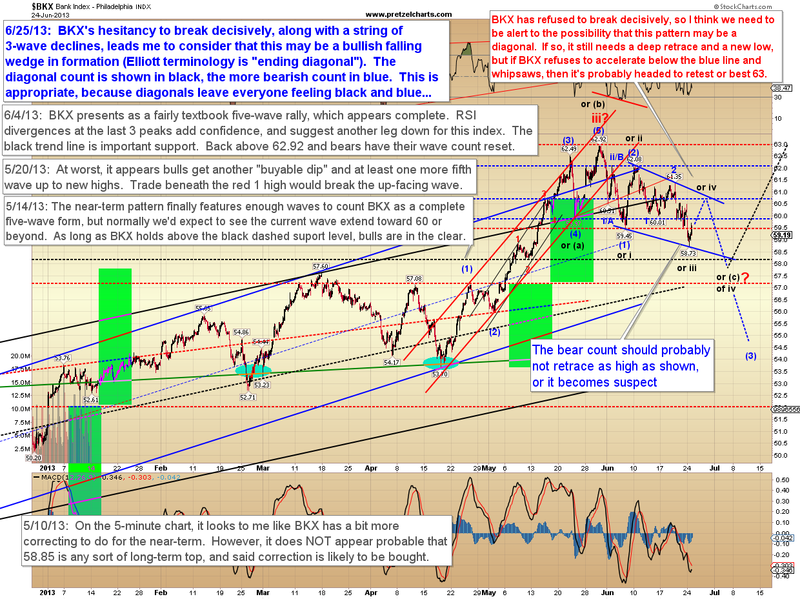 Given the signs we're seeing in the credit markets, bonds, et al; and the strength of the sell-off so far, I'm going to give the extended fifth wave even long-term odds with the fourth wave corrective count I've previously detailed -- for the time being. The market of course reserves the right to cause me to adjust these odds going forward (it's foolish not to adjust to the market's future input). 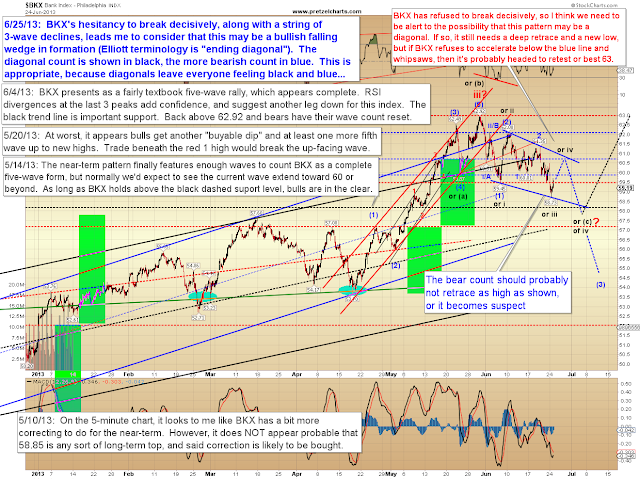 For the near-term, the count below details the least bearish potential. The wave may be considerably more bearish than shown, but I'm still not seeing the strength of the sell-off echoed in certain key markets, which is making me hesitant about the mega-bear counts. Play it safe for the time being though, because there is definite waterfall potential here. One market which has continued to refuse to commit to the bear case is the Philadelphia Bank Index (BKX). BKX finally broke key support yesterday, but it did nothing afterwards. This leaves a few possibilities, and I've detailed one bullish option, as well as the more bearish option, on the chart below. Both options suggest lower prices still to come, but the ending diagonal is a bear trap. In conclusion, the decline has been playing out strongly, and that necessitates consideration that things may be more long-term bearish than I originally anticipated. BKX is still hesitating to commit, however, and we'll simply have to see how this plays out over the next few sessions to begin connecting the long-term dots more decisively. Trade safe. The idea is that the Oct '11 - Sep '12 sequence is a leading diagonal A wave in the 2nd zig-zag of a double zig-zag off the Mar '09 lows. I know that the concept of a leading diagonal is not orthodox EW, but believe me I've seen enough of them in 27 years that I can assure you that they do occur.